According to two papers published in the journal Fertility and Sterility, estrogen levels at the time of embryo implantation via in-vitro fertilization (IVF) may be associated with increased risk of preeclampsia and other pregnancy/infant complications. Researchers from Massachusetts General Hospital suggest a means of lowering the risk. The original study was published in Fertility and Sterility in June 2012. Researchers involved with that study noted women with high estrogen levels immediately before eggs were retrieved were most likely to suffer preeclampsia or given birth to infants who were small for gestational age (SGA). The Massachusetts General team chose to follow-up on that study to test a possible solution – freezing the embryos until a later cycle when estrogen levels were lower. The initial study included nearly 300 women. The secondary study was much smaller with just 20 patients choosing to freeze embryos and 32 patients choosing to continue with the implantation as planned. Of the 20 women who chose to postpone implantation, just 10% gave birth to SGA infants compared to 35% of the women who chose not to freeze. Preeclampsia rates were even more dynamic. None of the women in the postponed group suffered from preeclampsia, but 22% of women who continued with implantation regardless of estrogen levels suffered the condition. Preeclampsia is a serious pregnancy complication that can lead to death of mother, infant or both. Researchers also noted that conservative ovarian stimulation could reduce risk as well. If patient plans are tailored to maintain estrogen levels below 3,000 pg/ml, risk of preeclampsia and SGA births would reflect the difference. If ovarian stimulation results in estrogen levels above 3,000 pg/ml, patients could choose to freeze embryos until a layer cycle when estrogen levels are lower. All of the women involved in the studies were pregnant with singlets. Multiples pregnancy comes with increased risk of pregnancy and birth complications, including preeclampsia and SGA birth, independent of estrogen levels during treatment. Source: Anthony N. Imudia, Awoniyi O. Awonuga, Anjali J. Kaimal, Diane L. Wright, Aaron K. Styer, Thomas L. Toth. 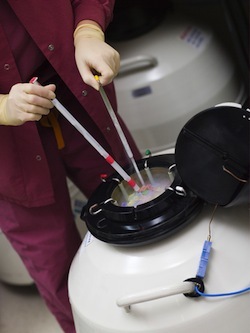 Elective cryopreservation of all embryos with subsequent cryothaw embryo transfer in patients at risk for ovarian hyperstimulation syndrome reduces the risk of adverse obstetric outcomes: a preliminary study. Fertility and Sterility, 2013; 99 (1): 168 DOI: 10.1016/j.fertnstert.2012.08.060.